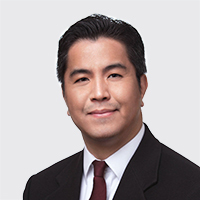 Wesley Liu began practicing workers' compensation law in 1999. He joined Mullen & Filippi in 2003 and represented a variety of employers and workers' compensation insurance carriers. After successfully counseling and defending them with respect to all areas of workers' compensation, Wesley became Associate Partner in 2006. Wesley attended and graduated from the University of California, Davis where he received a Bachelor's degree in Economics in 1993. He graduated from the University of San Francisco School of Law in 1998. Wesley belongs to the Workers' Compensation Section of the State Bar and has membership in the Valley Industrial Claims Association. In my career, the most important lesson I've learned is to be responsive to clients. While clients always want zealous representation, they also want experienced counsel for the best solutions. I was drawn to practice workers' compensation law because this was an area in which expedient resolutions often resulted in the most favorable results for both employers and the injured workers. One of my favorite places to visit is Lake Tahoe. We are fortunate to be only a few hours away from the mountains for vacations or short one-day excursions. In the winter, I enjoy driving to Tahoe with my children for skiing and sledding. In the summer, my family likes to go to the Lake for hiking, paddle boarding and canoeing.